Preheat oven to 400°F. Line a baking sheet with parchment paper and spray lightly with cooking spray. Gather rest of the ingredients. In a large saucepan over high heat, bring 10 cups water to a boil. Reduce heat to medium-low. 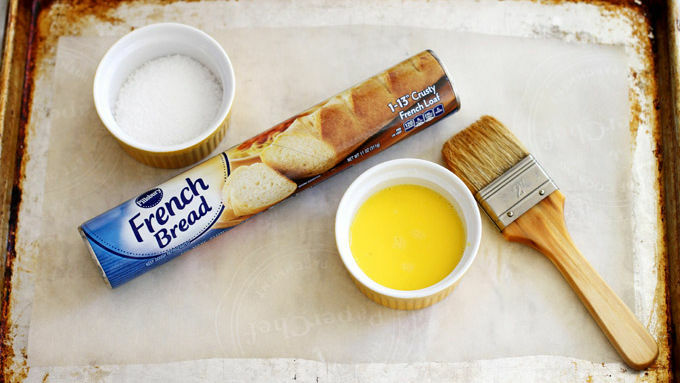 Shape French bread dough into a round, spiral-like shape; pinch seam tightly to seal. Using a slotted spoon or spatula, carefully drop dough into simmering water and cook 30 seconds; flip dough over, and cook an additional 30 seconds. Use slotted spoon to transfer dough to prepared baking sheet. Brush dough with egg wash, then sprinkle generously with salt. Bake 25 minutes or until baked through and deep golden brown. 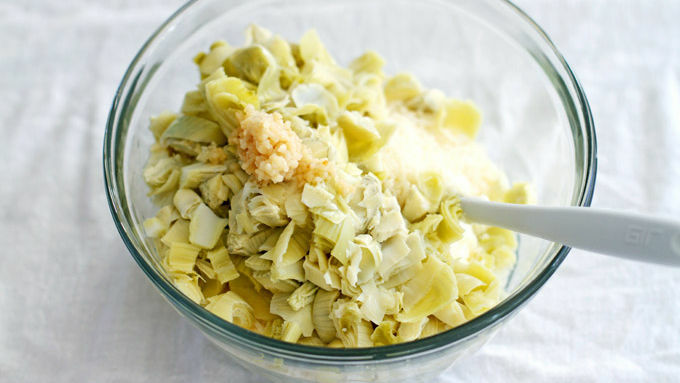 Meanwhile, make the dip: In a large bowl, stir chopped artichoke hearts, shredded cheese, yogurt, mayonnaise and garlic until combined. Heat in microwave on high for 5 minutes, stopping microwave to stir mixture occasionally, until warmed through. Use a serrated knife to cut a hole in the top of the pretzel bread bowl. Spoon dip into bowl. Serve immediately. 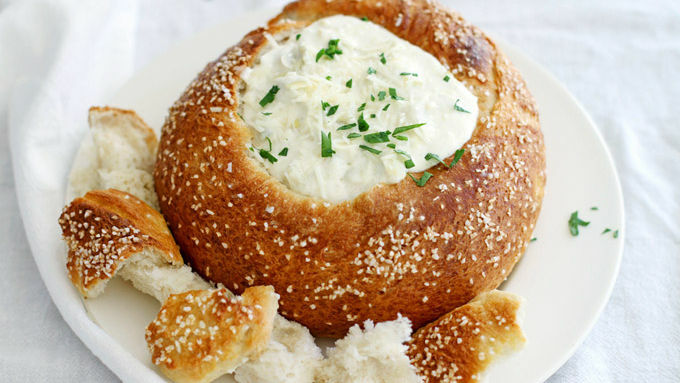 Serve dip with torn pieces of the pretzel bread bowl, along with cut vegetables, pita chips and/or crackers. If you don't have a party coming up, plan one so you can serve this. 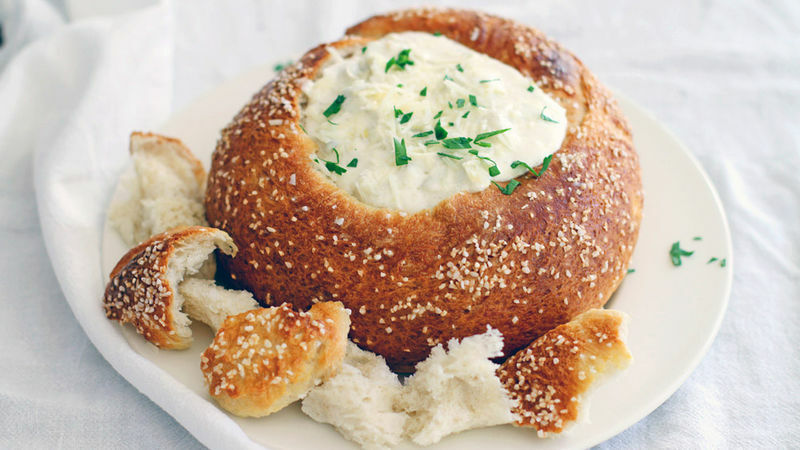 There’s something I need to tell you and that something is: See this easy artichoke dip in a pretzel bread bowl? You need to make it, like, right now. Drop everything. It’s that important. Why, you ask? Not that you would, because hello—cheesy dip inside a soft pretzel, amiright? But in any case, I’ll tell you. 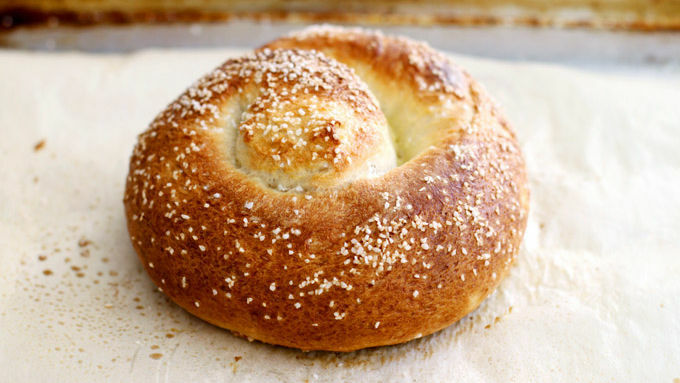 Because the salty soft pretzel bread bowl takes about 5 minutes to prepare. Because the hot, cheesy artichoke dip also takes about 5 minutes to prepare. Because in a half-hour, you will have this entire thing done and ready to devour. And devour you shall (at least that’s the route I took, and I do not regret it). Use a serrated bread knife to cut out the center top of the pretzel bread bowl, then spoon in summa that hot, cheesy artichoke dip. Tear the extra bread into pieces for dipping, along with some cut veggies or crackers, if desired. And now is the time to drop everything, dip and devour. You will be oh-so glad you did.